We all feel a bit stressed sometimes, in 2014 it was estimated that 1 in 4 Australians reported suffering moderate to severe levels of stress. We can assume that the stress being reported in this instance was chronic psychological stress, which, like the stress on your lungs from smoking, is tough for your body to adapt to and probably best minimised or avoided where possible. But is all stress bad and is all stress equal? Is the stress we experience training in the gym equal to the stress from multiple nights of poor sleep? We can look at stress from a few different perspectives, this article would like to explore the idea of healthy stress (eustress) and unhealthy stress (distress). Often the difference between the two is the amount of stress rather than the type of stress. A famous saying from pharmacology comes to mind ‘All drugs are poisons, what matters is the dose’. When thinking about healthy stress let’s use the example of someone who is smart enough to enjoy lifting weights. When she/he first began lifting they started with an empty bar, over time they were able to add more weight to the bar as their body adapted to this stimulus and became stronger. Eustress is the stimulus that drives a positive change, in our example the adaptation is building strength and co-ordination so that our lifter can handle heavier weights. However, if the lifter started with 100kg on the bar in their first session the body may have been injured (distressed) as it was not given the opportunity to adapt to this load. We could draw an analogy between stress from training and stress from sun exposure. A little bit of sun is good for us and if we repeatedly expose ourselves to enough sunshine we will develop a tan. However if we stay outside too long in one go we will get burnt. It’s all about finding that delicate balance between stress and recovery. We can think about stress in terms of reaching an optimal level. On the far left of this diagram we have no change due to insufficient levels of stress. In the middle we have eustress and on the far right we have distress. Our body has the amazing capacity to adapt to given circumstances but only to a point, going beyond this point causes one to move away from a positive outcome. Stress acts on the whole organism (you!) it is not specific to one area of your life, thus stress from other areas in your life will affect how much you can productively achieve in the gym. 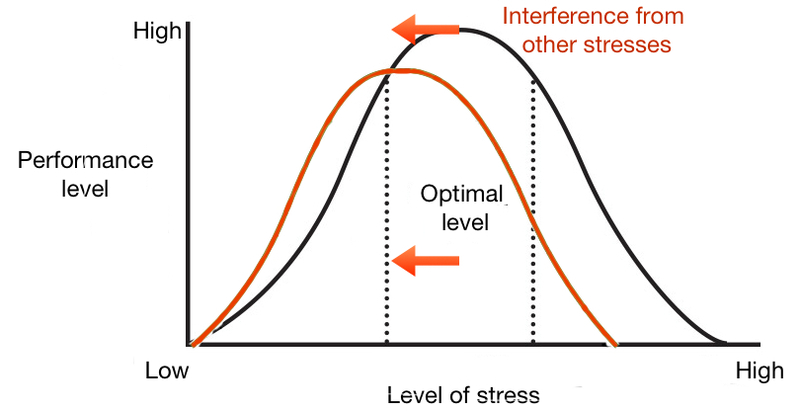 The dose of stress that amounts to eustress and the dose that amounts to distress will be unique to both the individual and their current circumstance. For example, perhaps our weight lifter friend lifted 130kg in their last training session but today they are feeling sick, had a poor night’s sleep and have been working overtime. Thus their stress curve has been shifted across to the left (red curve) and today they should only lift 120kg. 120kg is the better choice for today because their body is managing other stresses, today 130kg might be too heavy and put them at risk of injury. Over time if the lifter wants to progress, they will have to learn to manage their work stress, their sleep and their health to the extent that they can. However, when the lifter has been unable to manage those outside stresses, it is important that this is accounted for in their training otherwise they risk adding to their distress, rather than stimulating an improvement. We have discussed small incremental doses of stress and how everyone at a given time has a different capacity to handle stress. We also need to think about recovery in between bouts of stress and how important this is in making progress. To revisit our sun burn analogy; we know the optimal amount of sun exposure per day is approximately 15 minutes. Instead of getting 2 hours of exposure in one sitting, we can allow the skin to recover and adapt between bouts of ‘stressful’ sunshine by spacing out our exposure across a week. This way we’ll top up our vitamin D levels (maybe even develop a tan) without the risk of sunburn. Resting after a given stress (eg a training session) allows the body to heal and adapt creating stronger and more resilient structures. As with the amount of stress that one can handle, the amount of recovery a person requires is individual to both the person and their circumstances. When we do not have adequate recovery we cannot adapt and progress, we may even regress. The latter scenario is called ‘over-training’ or ‘under-recovery’, it’s the training equivalent of leaving my Irish boyfriend in the desert with no sunscreen. Stress in the correct dosage, followed by a period of recovery is healthy and necessary in making progress. Without stress there would be no motivation (or stimulus) to change (or adapt) and without change one can’t become more awesome. Stay tuned for my next blog where I’ll discuss what types of stresses we can adapt to and some types we are better off minimizing or avoiding altogether.